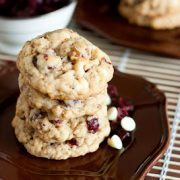 Soft and chewy oatmeal swirled cookies dotted with sweet dried cranberries and creamy white chocolate chips! Preheat oven to 350 degrees. In a mixing bowl, whisk together flour, rolled oats, baking soda, baking powder, salt, cinnamon and nutmeg, set aside. Slowly add in flour mixture and mix until incorporated. Add in dried cranberries, white chocolate chips and optional nuts. Roll cookie dough into balls, about 2 Tbsp per ball, and drop onto buttered cookie sheets. Bake 9 - 10 minutes until lightly golden. Allow to cool several minutes on cookie sheet before transferring to a wire rack to cool. Store cookies in an airtight container.